Dan Peterson, probably my favourite blogger on sports science, has a recent piece in Science Daily on How Baseball Players Catch Fly Balls. He usually posts on his excellent blog, Sports Are 80 Percent Mental. His post, as usual, is excellent, but I wanted to take issue with the slightest of details (because that’s just how I am): why do novice outfielders often take a step forward when the crack of a bat and the launch of a ball indicates that a fly ball has just been hit in their direction? As a former and largely inept outfielder for the Ascension Catholic Church ‘Steamrollers,’ 2nd grade and under team (I was more of a junior soccer player), I well remember our coach, Dr. Wickersham, telling us repeatedly, and to little effect, ‘don’t start running forward until you know the pop-up is going to fall in front of you.’ I also clearly remember the sinking feeling when, after failing to heed his advice, a fly ball flew over my head as I charged toward it, ultimately landing almost precisely where I had been standing the instant that ball was hit. Peterson discusses a recent paper in the journal, Human Movement Science, ‘Catching fly balls: A simulation study of the Chapman strategy,’ by Dimant Kistemakera and colleagues. Kistemakera and his team set out to test the slight variations between the trajectories fielders took when running to intercept a fly ball, and the trajectories predicted by Seville Chapman’s ‘strategy’ of using the acceleration of the ball in one’s vertical field to control whether one was too close or too far from home plate to make the catch. The article “If I Were You: Perceptual Illusion of Body Swapping” by the Swedish researchers Henrik Ehrsson and Valeria Petkova appears this week in PLoS ONE, and is ably summarized over at Neurophilosophy. 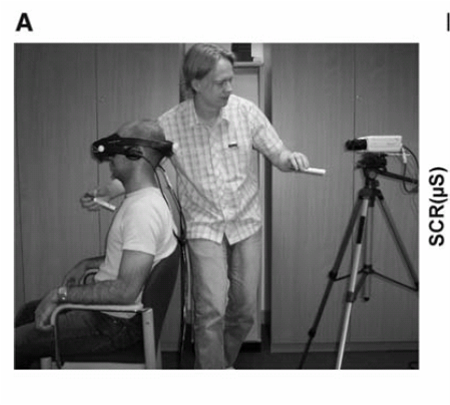 You can also read Ehrsson’s previous article on the virtual arm illusion and his Science piece on the experimental induction of out-of-body experiences. The approach in all of this research is rather simple. You can see the out-of-body experiment design pictured to the right. Body swapping adds another person with goggles. A subject stands or sits opposite the scientist, as if engaged in an interview.. 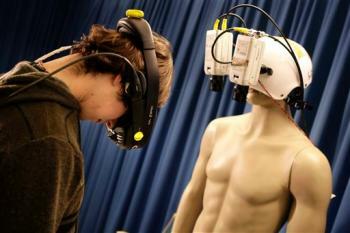 Both are wearing headsets, with special goggles, the scientist’s containing small film cameras. The goggles are rigged so the subject sees what the scientist sees: to the right and left are the scientist’s arms, and below is the scientist’s body. To add a physical element, the researchers have each person squeeze the other’s hand, as if in a handshake. Now the subject can see and “feel” the new body. In a matter of seconds, the illusion is complete. This “switching” happens because the brain is literally embodied – after growing up with this particular body, it’s a fair assumption to assume that one’s eyes and one’s hand are getting feedback about the same interactive phenomenon. For a first-person view of this, see Karl Ritter’s AP article today on the body-swap illusion, which includes this photo of the two-goggle set-up. Ehrsson is excited about being able to trick the brain in this way: “You can see the possibilities, putting a male in a female body, young in old, white in black and vice versa.” The NY Times article pushes the uses body swapping can have in therapy. I’ve decided to post a version of this paper here, with the caveat that it’s still a work-in-progress. I’d be delighted to read any feedback people are willing to offer. 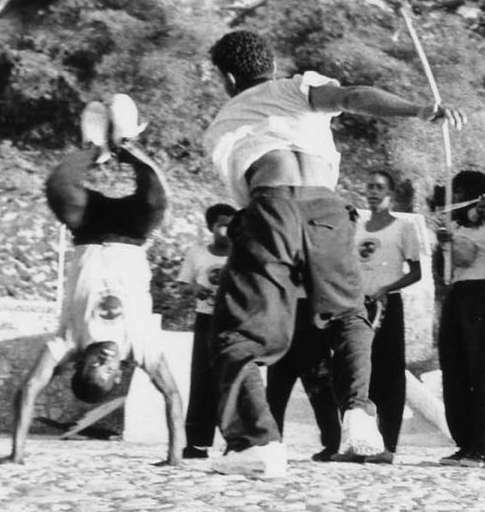 As a cultural anthropologist interested in the effects of physical training and perceptual learning, I see ‘neuroanthropology’ as a continuation of the cognitive anthropology advocated by Claudia Strauss and Naomi Quinn (1997). The new label, however, reflects engagement with a new generation of brain research, what Andy Clark (1997) refers to as ‘third wave’ cognitive science, or work on embodied cognition.1 Much of the ‘third wave’ does not focus strictly on what we normally refer to as ‘cognition,’ that is, consciousness, memory, or symbolic reasoning. Rather embodied cognition often highlights other brain activities, such as motor, perceptual and regulatory functions, and the influence of embodiment on thought itself; this is the reason I’m thrilled to have endocrinologist Robert Sapolsky as part of this panel, as his work is part of the expanded engagement of neuroanthropology with organic embodiment.2. Scholarpedia has an entire entry on the neural correlates of consciousness, which argues for including the neural correlates for conscious precepts (that’s a dog!) as any part of understanding how we are consciously aware. 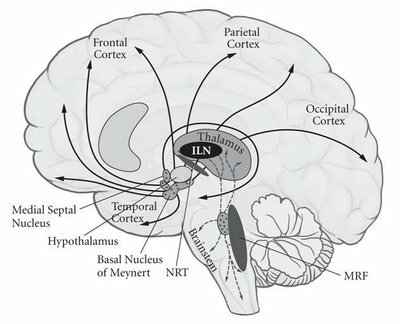 In this case, the neural correlates of both basal arousal (see image below) and activity in the inferior temporal cortex are necessary for us to be consciously aware. This Scholarpedia page is maintained by Christof Koch and Florian Mormann, both at Caltech. Mormann is a post-doc; his latest article on “Latency and selectivity of single neurons indicate hierarchical processing in the human medial temporal lobe” (pdf) appeared in the Journal of Neuroscience.